SERVPRO of East Riverside City is fully equipped with the best equipment for water, fire, smoke, and mold damage. 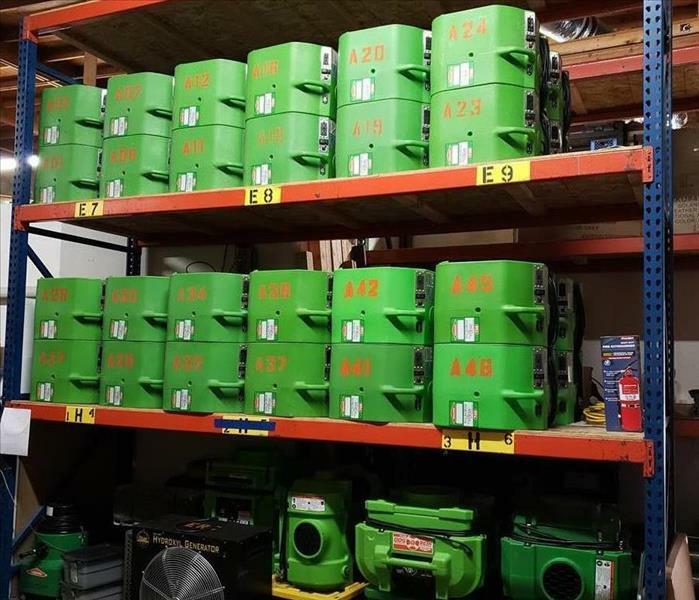 Industrial strength air movers and dehumidifiers remove moisture from the air, dry out walls, floors and even furniture. Air scrubbers remove the airborne contaminants and control the air quality. Mold is most commonly found in the bathroom and kitchen of any home or office building. 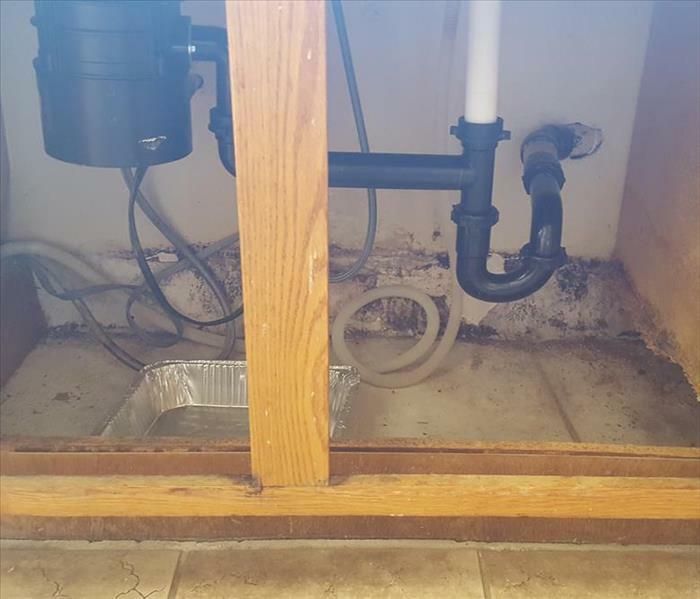 This home in Riverside California had a small leak that went unnoticed for some time, allowing mold to grow in the cabinet under the kitchen sink. Once the dishwasher was moved you could clearly see the damage done from the side of the cabinet. 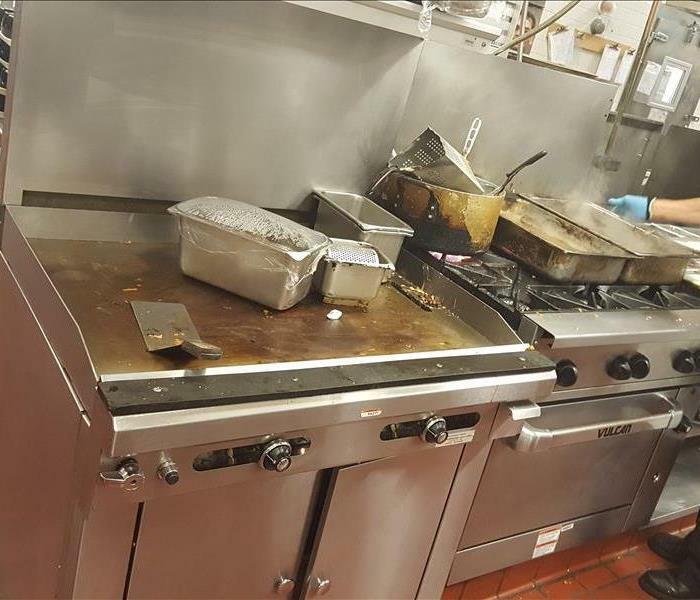 The professionals at SERVPRO of East Riverside City removed all the damaged material, cleaned the affected area with an anti-microbial agent which kills microorganisms or stops their growth. Air scrubbers and Negative air fans were also used to rid the air of any mold spores to prevent the mold from spreading to other areas of the home. The Woosley Fires in Venture County California in November 2018 burned 96,949 acres of land. The fire destroyed 1,643 structures, killed three people, and prompted the evacuation of more than 295,000 people. Damage to homes in the area and near by areas were not just from the flames but also the smoke and soot that traveled due to the winds. SERVPRO of East Riverside City was there to help with some of the aftermath from this horrific fire. Here our technician is cleaning soot from the outside of a home spared by the flames but highly effected by the smoke and soot. Soot is extremely small in size and makes a toxic composition of burned debris. It can travel deep into the lungs, where the compounds it consists of can do some serious damage. Soot can also negatively impact indoor air quality thus needs to be removed properly with specialty equipment to clean the air. Dealing with any type of disaster in your home is stressful enough, whether it is damage from a water leak, fire or mold discovery, the team at SERVPRO of East Riverside City is here to help. Not only will our team of trained professionals care for the remediation of the loss we will also care for your belongings as if they were our own. Our team will carefully pack and store all your belongings in a safe secure location until all the work on your property is complete. Our team will then return all your belongings to its original location, so you do not have to. The SERVPRO of East Riverside team knew of a special event happening at the Rowland Heights Community Center. Being a part of the community our team cleaned the carpets in preparation for the event free of charge! We really are #HeretoHelp ! Every mom can relate to that feeling when the children are playing quietly; first happy that they are getting along quickly followed by worry that it's TOO quite. Well, this is why every mother has the worrisome feeling. The children were playing with the downstairs toilet when something obviously went wrong causing major flooding! Drywall, flooring and the HVAC unit all had to be removed to fully dry out the affected area. Thankfully the hero's of SERVPRO East Riverside where there to make it "Like it never even happened." Mold grows everywhere - with the right conditions. Mold loves moisture and humidity. Mold also needs something to eat, like wood, drywall and carpet. This is one reason it is so important to properly dry-out any water damage or spill as soon as possible. 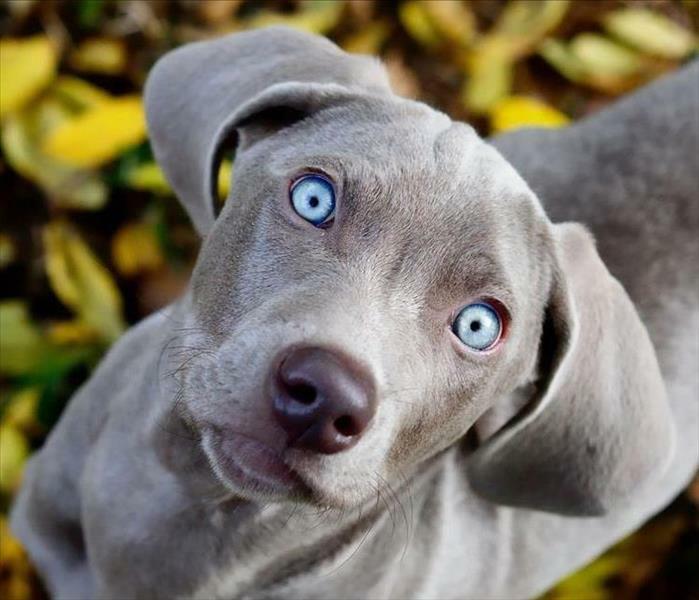 If you see this; don't panic, call SERVPRO of East Riverside! A water hose came undone at this Veterinary Hospital in Riverside causing major flooding. The pro's of SERVPRO of East Riverside City were able to extract the water and start the mitigation process. Click link below to read the full story online. There are some terms used by our industry that may be new to a home or business owner. Containment is when the affected area is closed off using tarps to create a barrier, trapping all the debris or mold spores to a confined area. This also allows you and your family to carry on as usually while repairs are being made. Containment is especially important when dealing with mold. Mold spores are microscopic and cannot be seen with the naked eye. If an area that contains mold is agitated the spores can become air born and spread throughout the home. Thus, before any work is started containment will be build to prevent any mold spores from spreading to other areas of the home. What's Growing Under The Sink? A small leak left un noticed can cause a lot of damage. Under the kitchen sink is a common area for leaks and is not normally checked by homeowners. As you can see the entire bottom shelf of the cabinet area was basically eaten through by the mold. A small amount of water and the right temperatures made a perfect home for this mold to grow. With the heavy rains here it's common to discover leaks in the roof. Protect your home from further damage with a trap that will prevent any more water from entering your home until the needed repairs can be made. If needed SERVPRO can help you properly dry out any area that may be affected by the leak. The owners of this home suffered a devastating loss when they garage caught fire and spread quickly throughout the home. As you can see even their car in the drive way could not escape the flames. This is the definition of an emergency! Yes this is a photo of what you think, sewage that has backup into the hallway of an office building. SERVPRO of East Riverside was there to clean it up and get this office back to normal. This vacant home in Hemet California suffered major damage when the garage caught fire. Thankfully no one was hurt. The garage collapsed and smoke spread to the majority of the house. The risk of Mud slides are always on the mind of homeowners living near hills. This is what they fear; massive amount of mud and water suddenly filling their backyards and homes, as the pressure from the fast moving water pushes mud and debris into the home through the door and window frames. Removing the leftover dirt is one task, drying out your home is another. 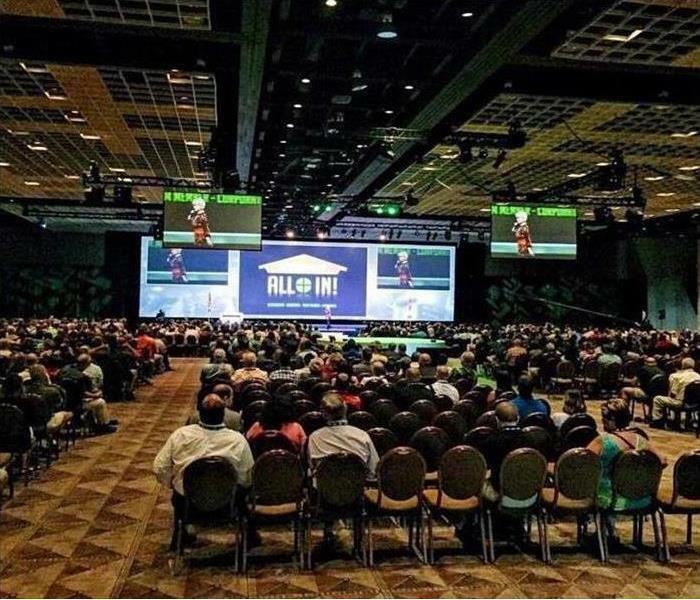 If this happens to you, don't panic - call SERVPRO. 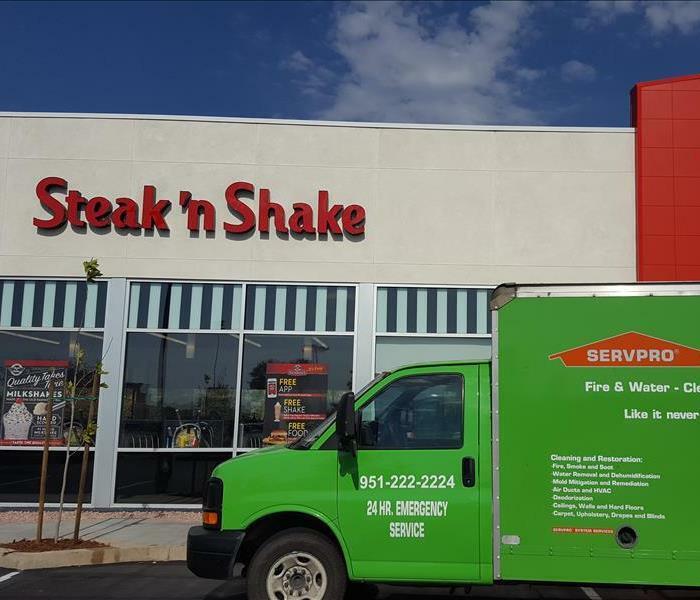 The first Steak'n'Shake opened in Riverside California in August 2016 and SERVPRO of East Riverside was there is help them make sure everything was perfect for opening day. Our Green team stripped and waxed the floor. Stop in and have a shake for us! This Dental Office in Riverside had a major water loss when a bathroom in the hallway leaked over the weekend. Thankfully they knew how to call and SERVPRO of East Riverside was on sight to clean up the mess getting the office back up and running in no time. Here is two of our marketers Liselotte and Sabena at the 17th Annual Riverside Chamber of Commerce Golf Tournament held at the Jurupa Hills Country Club on Monday September 19th. 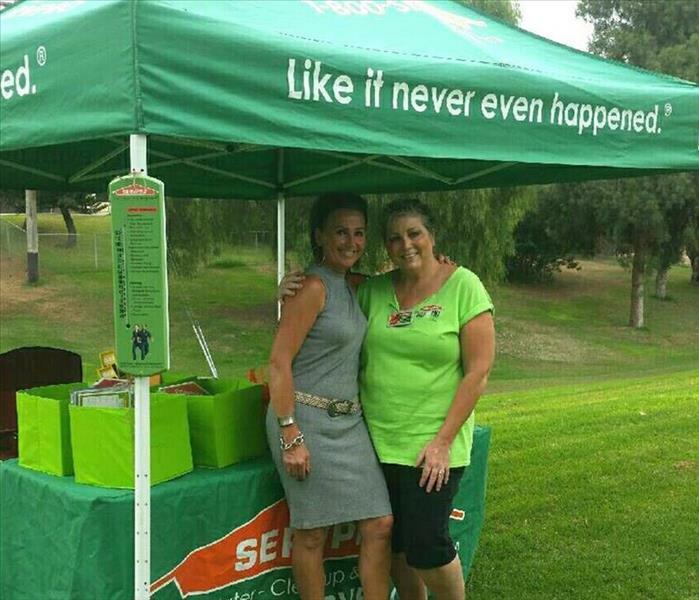 SERVPRO of East Riverside City had the privilege of sponsoring this event this year and we had a blast! Although most of us do not golf personally, it was fun playing games and passing out prizes with our new prize wheel to all those that stopped by our table. We hope to see you all next year! For more pictures follow us on Instagram @SERVPRO10102 or on Facebook at SERVPRO East Riverside. Heavy rain brings many different danagers including mud slides. This ranch style home in Riverside California suffered major damage when the hill behind their home sent a wall of mud into their backyard. The mud filled the swiming pool and then began to enter the home. As seen here the bathroom filled with muddy water from outside! Thankfully the professionals st SERVPRO of East Riverside were there to help clean things up and make it "Like it never even happened." 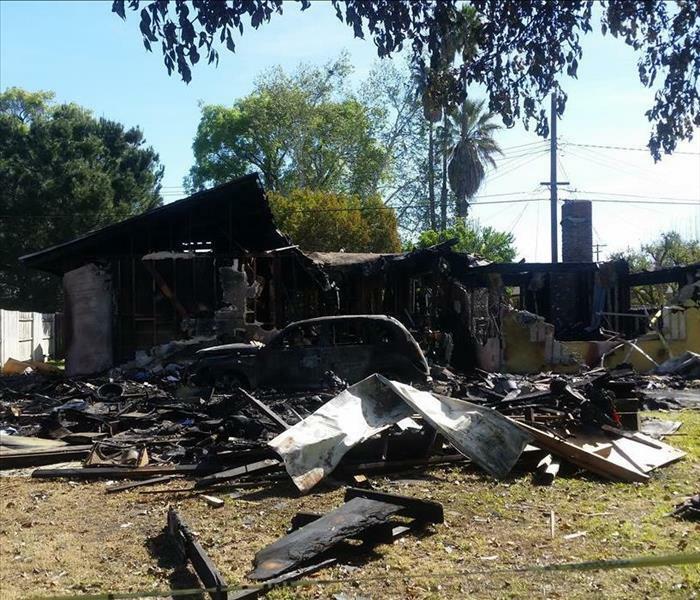 April 2014 a Fire almost completely destroyed this home in Riverside CA. SERVPRO was there to clean up the mess. The fire had destroyed the kitchen and most of the living room. This rental property in Riverside was thankfully empty when a fire broke out in the kitchen causing damage to the appliances, as shown, and multiple rooms. Thanks to a watchful neighbor who called the fire department the house was saved. 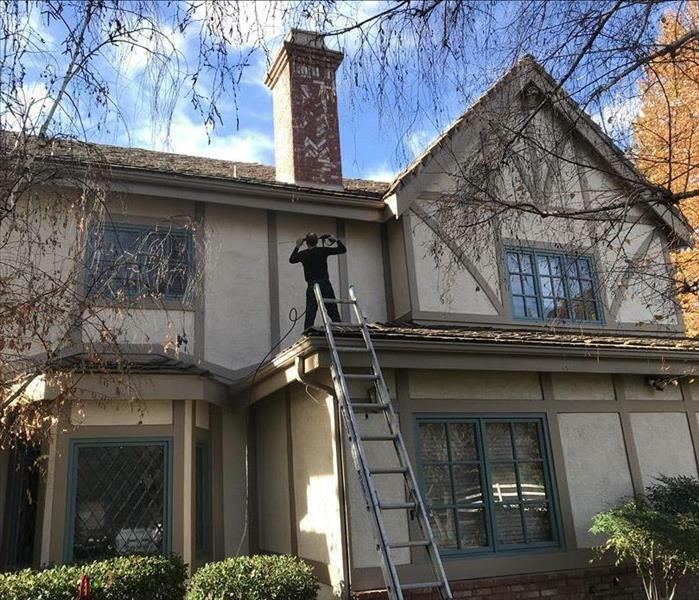 SERVPRO of East Riverside City was there to clean up the rest of the mess, including boarding up the windows to secure the home from potential intruders while the repairs are made to make it "Like it never even happened"! 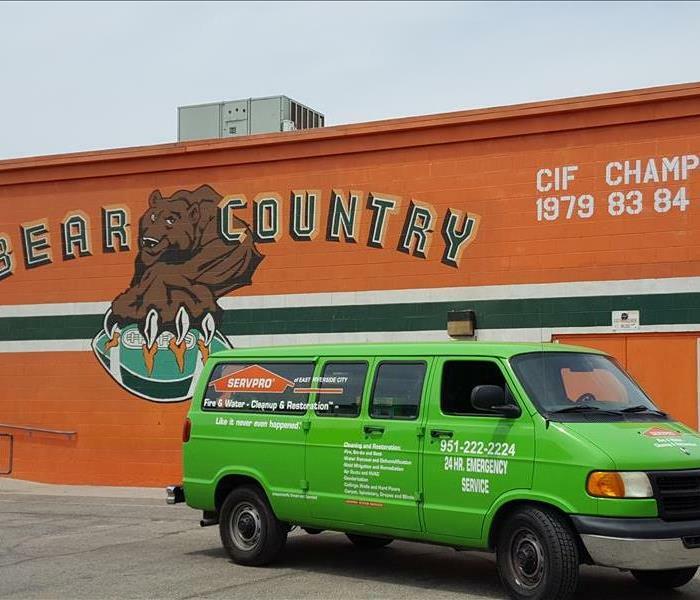 SERVPRO is working Riverside Unified School District to remove mold found in boys restroom at Poly High School. The entire floor was removed along with some drywall. By the time school is back in session it will be Like It Never Even Happened. 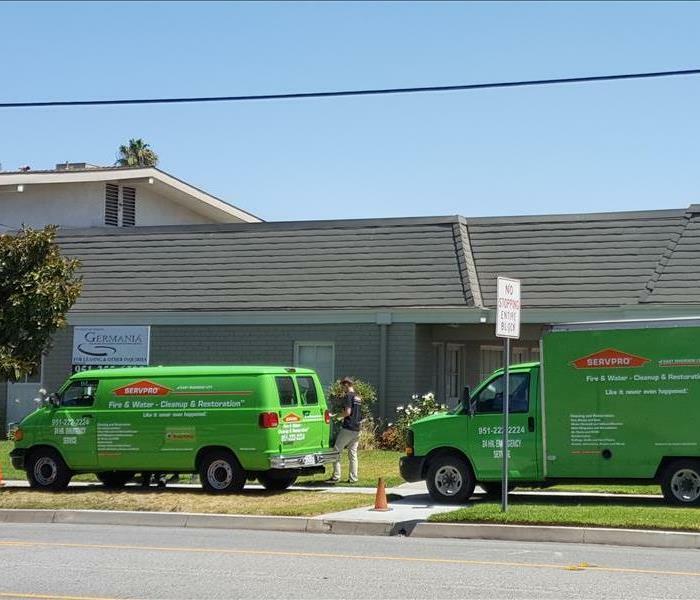 SERVPRO of East Riverside and the Riverside Unified School District have been working together for over a year to improve the campuses in Riverside. We are proud to be a part of the community in this way to ensure the Health and safety of the children and school faculty in our community. Altura Credit Union in Riverside was having their sprinkler system tested when It was accidently set off, causing the third floor office's and conference rooms to be flooded. SERVPRO East Riverside was there within a few minutes of the call to help with the clean up. No job is too big for Team Green! Storms in July of 2014 cause a large tree to fall on a house in Riverside causing major damage to the structure of the home. SERVPRO was to the rescue! The tree was extracted and structural damage was repaired. A large section of the house was also damaged and was rebuilt. Flooding in this commercial building after pipe in the ceiling tile broke. SERVPRO was on sight within 30 minutes to help turn off the water and extract the standing water that had gathered. Due to our quick response this business did not suffer any time lost and business was back to usual the next day. This is a common problem in any home, leak in the water heater. If not properly cared for this can quickly turn into larger problem with costly repairs. Thankfully in this case the homeowner caught it quickly and was able to mitigate the damage. The water line to this laundry room sprung a leak, causing water damage in the cabinets and drywall connecting the laundry room and garage. 2 Air movers and a dehumidifier was placed to ensure proper dry out and to prevent mold growth. Some of the cabinet was removed but the drywall and floor was restored. 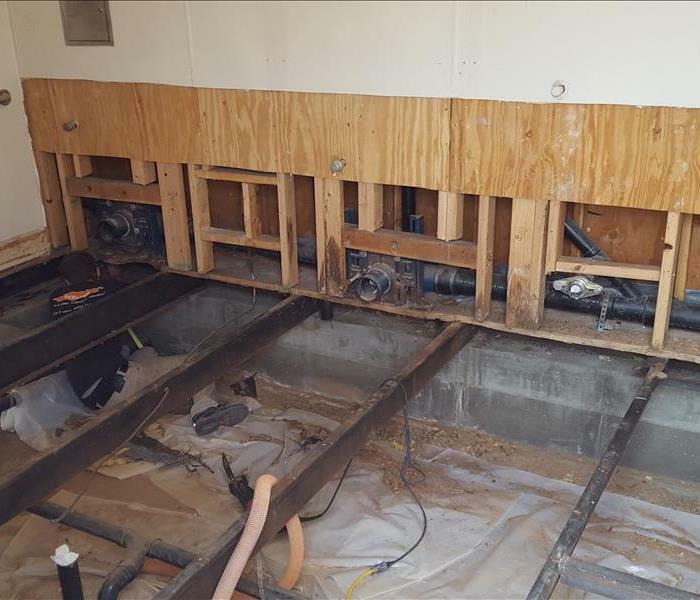 Single story home in Moreno Valley California suffered a water loss when the water heater began to leak. No one was home when the leak started causing the water to run into several rooms of the home. Carpet and laminate wood flooring needed to be removed to ensure a proper dry-out and prevent mold growth. When dealing with mold removal it's important to have a secure containment around the affected area to prevent the mold spores from spreading. Adding an air scrubber helps remove the mold spores during demolition and rebuild work. This vacant commercial building in Riverside suffered saver water damage when a water line broke. Water pulled in the restroom and traveled into the hall way and larger converance rooms. 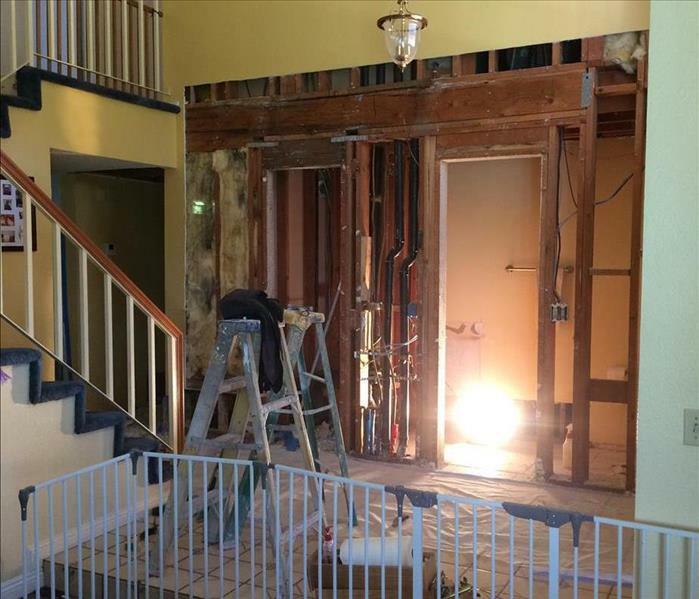 December 2014 a Single Family Home in Rowland Heights California suffered water damage in the kitchen and living room area resulting in savior damage to a large section of the house. We were able to extract all the water and prevent the growth of mold. All of the cabinets and wood flooring was removed. While working on repairs to this restroom at a local high school mold and rotten wood was found under the floating toilet and urinal. The entire floor was removed including some dry wall to completely remove the affected material. 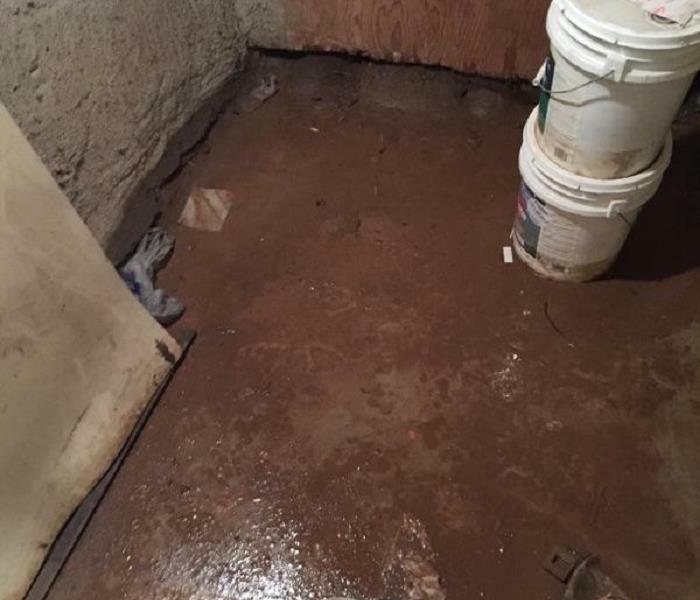 A small clinic in Riverside California had major flooding in their basement after a weekend of heavy rain. Unfortunately the flooding went unnoticed until the power went out. By then the water was a few inches high and quite a bit of mud had accumulated, as shown in the before picture. Thankfully SERVPRO of East Riverside was there to extract the water, mud and other debris. This kitchen stove caught fire due to an electrical malfunition. Thankfully the family was not at home so everyone was safe. Unfortunately the fire spread very quickly and burned the majority of the kitchen, dining room, living room and send thick black smoke to the the entire house. This rental property suffered water damage to the majority of the home when heavey rains hit. Shown is the covered patio which you can see the water stains where the rain came in, not shown is the ceiling that has similar stains. 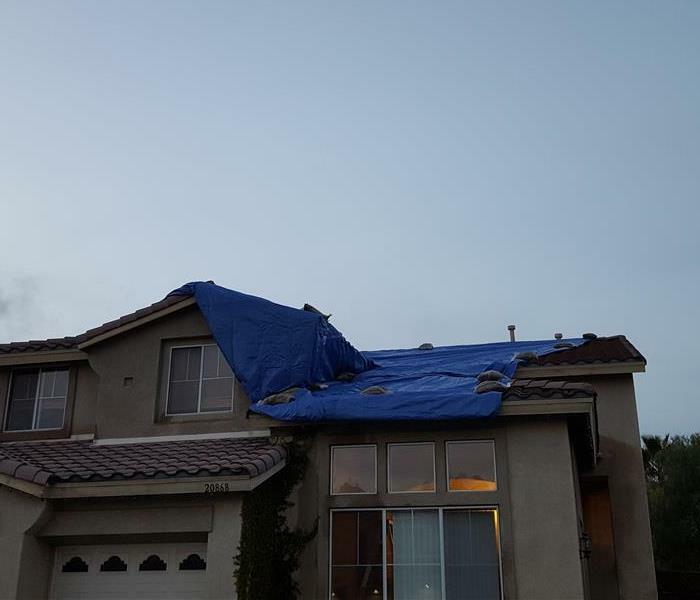 When unexpected strong winds and heavey rain hit Diamond Bar, California a few roof tiles came loose causing leak in the ceiling and water damage in the rooms below. While the water damage to the rooms were being dried out SERVPRO of East Riverside placed a tarp on the damaged area until it could be repaird. Just as you may schedule deep cleaning of your home once a year so do most businesses. 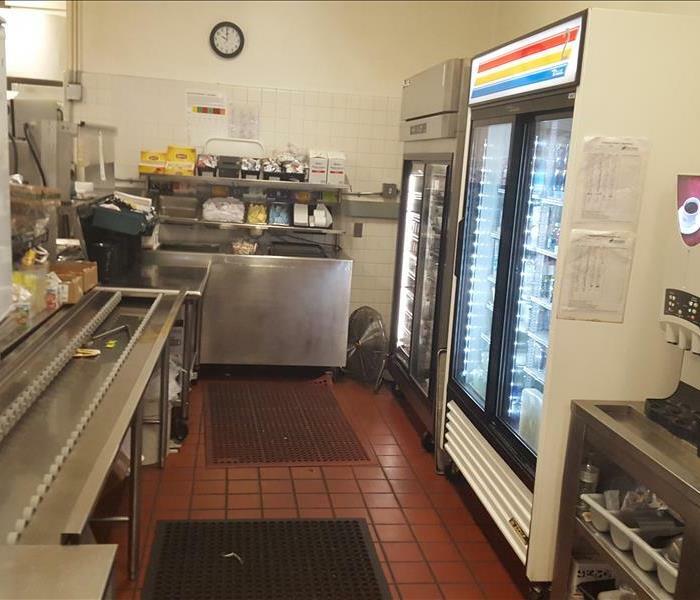 The Riverside Cimmunity Hospital came to the professionals at SERVPRO of East Riverside to help give the cafeteria and kitchen a good deep clean. As you can see there was a build up of greese and dust from the use of the grill in the kitchen area. With some elbow greese and some hard work SERVPRO's Team Green was able to get this kitchen to almost like new condition. The manager, Raven was very happy with the finished product and said she will call us again. 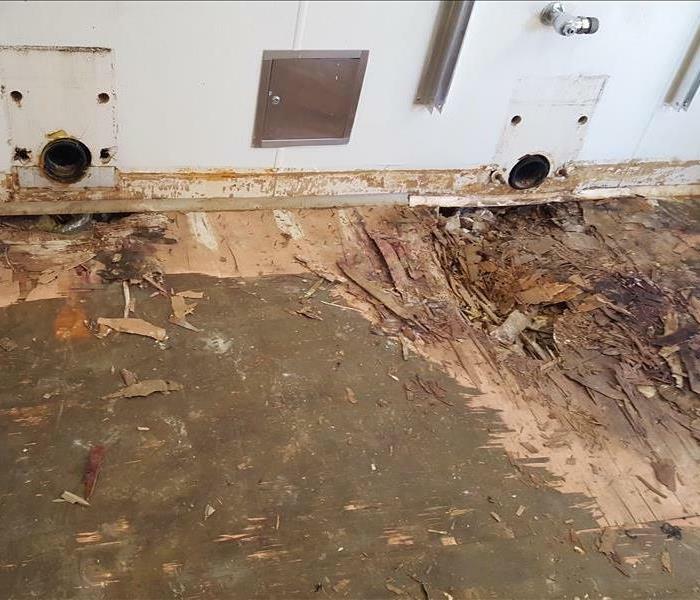 A rental property in Corona was an unknown sewage leak under the bathroom for a few weeks. Some of the contaminated water soaked into the soil under the house but the smell and baceria lingered. The professionals at SERVPRO of East Riverside suited up, in biohazard safety suits, to removed all the waste and contaminated soil from under the house replacing it with fresh sand. "Like it never even happened." Water damage never stays to just the building, it affects everything in it's path. Here is just one example, records that were in the back of a hall closet were effected when a water line broke within the wall. An example of how a small problem can cause major damage and one huge mess. 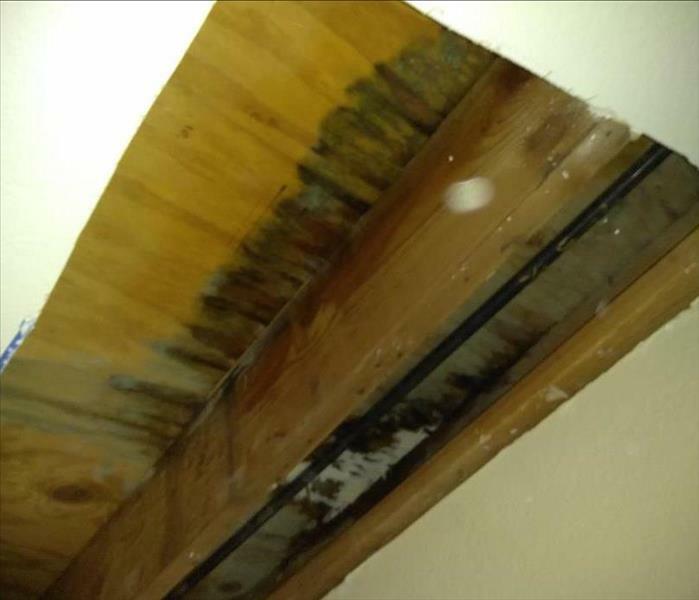 This two story home in Walnut California suffered a major loss when a pinhole leak flooded the downstairs bedroom, bathroom and hallway. Thankfully SERVPRO of East Riverside was there to clean up the mess and make it "Like it never even happened".